Warm weather throughout the year, beautiful ocean and lots of nature. Architecture, design, and art galore. We wanted to visit the creators’ spaces based in the US west coast, which has them all. After Japan, we hopped over to the US west coast and we asked about their artistic lives and their work. In downtown Los Angeles, where modern high rises and classic buildings coexist, there are many 1920s Art Deco buildings, especially in the area near where Ace Hotel transformed an old United Artists (Theater) Building into guest rooms. 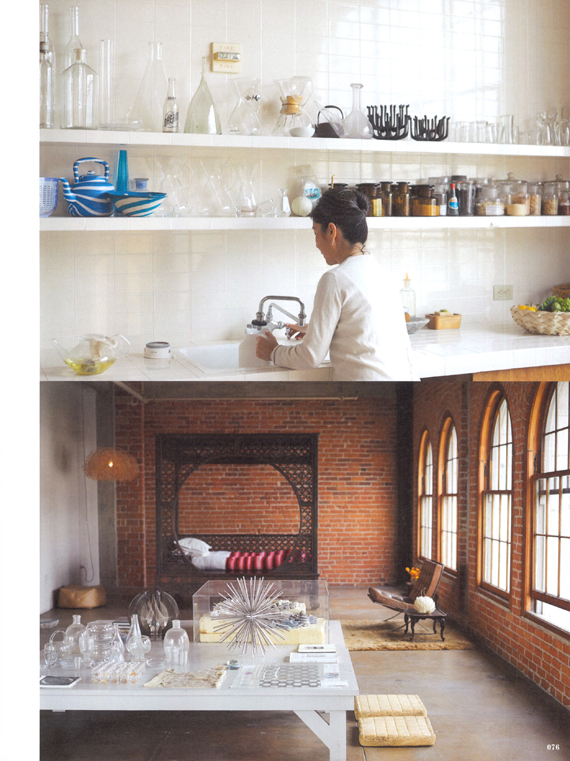 Amongst them is dosa designer Christina Kim’s home base. It may surprise you, but not everything in her space is a luxury item. She hardly buys any furniture, and the low table for display is used repeatedly by painting them over from time to time. The closet that holds Christina’s wardrobe is reclaimed from the United Artists building. At the dosa factory, no fabric is wasted, and all the scraps are saved and put back into production — a recycling practice dosa started in 1996 and has been committed to ever since. Christina has always been interested in working with artisans that have regional and traditional techniques, but it was Oaxaca, Mexico, that made her really think. Christina travels six to seven months out of a year. Mexico, India, Japan, and Marfa, Texas are the places she repeatedly visits. She also says that without these journeys, her work now would not exist. Born in Korea. Moved to L.A. when she was 15. Established dosa in 1984. 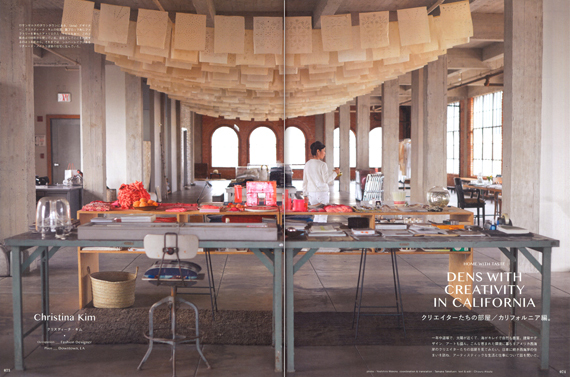 She works with artisans worldwide, whom she met through travels. Her work, which creates an original world through design that uses traditional techniques, is critically acclaimed. She has been doing museum installations lately as well. Christina Kim. Occupation: Fashion Designer. Place: Downtown, LA. Top: Christina in her kitchen. Bottom: In the rear of the space is a guest bed. “It was a bed used for smoking opium.” Designer furniture is indistinct except for a lone Barcelona chair. The glass in the forefront is by Kaj Franck. In the foreground is a large sitting pillow. To the right, a reclaimed closet. In the background, kitchen and dining areas are visible. 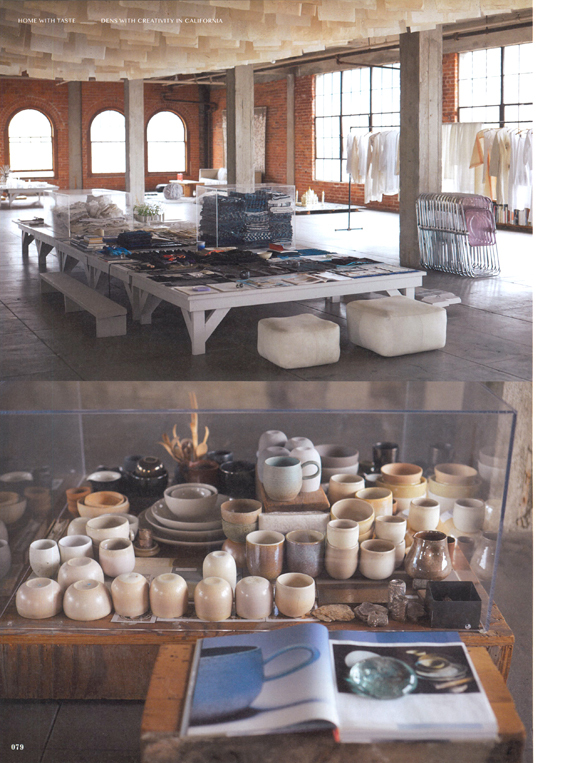 Ever since she viewed a special denim collection in 1999, indigo has been commanding her interest. 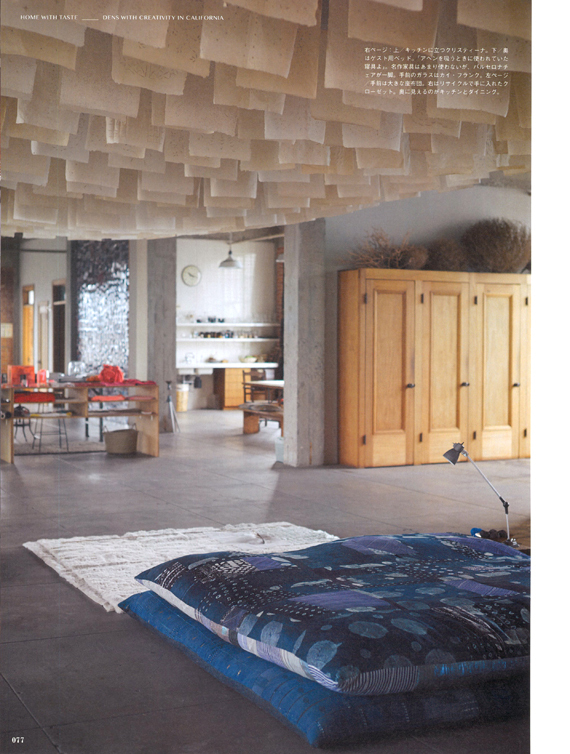 Top: All inspiration sources are flatly displayed. Mahatma Gandhi and Taj Mahal are two of the things she loves the most. 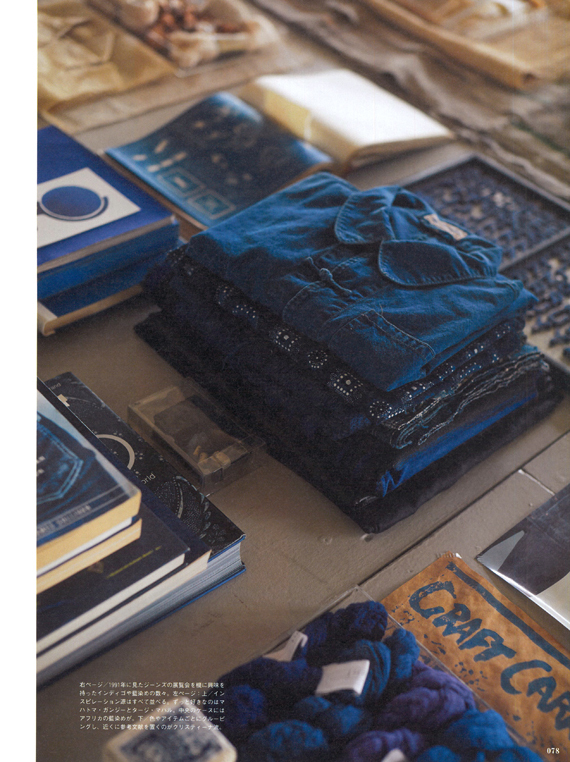 In the middle case, folded African indigo textiles. Bottom: Organized by color and item. Christina leaves related literature close by. Left: To preserve each culture’s techniques, Christina archives processes thoroughly. Center: Christina says, “Functionality and design, and if it’s somehow alive, then it’s a good design.” Her favorite designs are by Dieter Rams from Germany and Enzo Mari from Italy. In the bedroom. 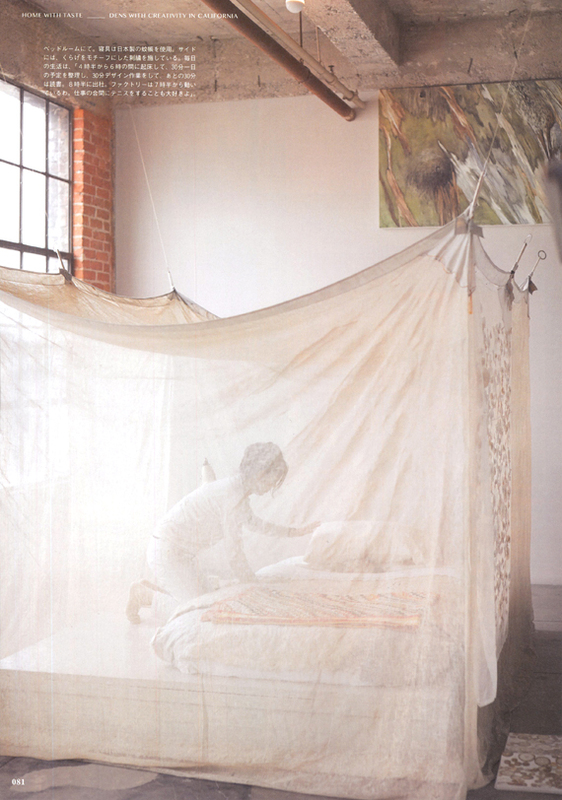 The screen, a mosquito net from Japan, is embroidered with jelly fish motifs. 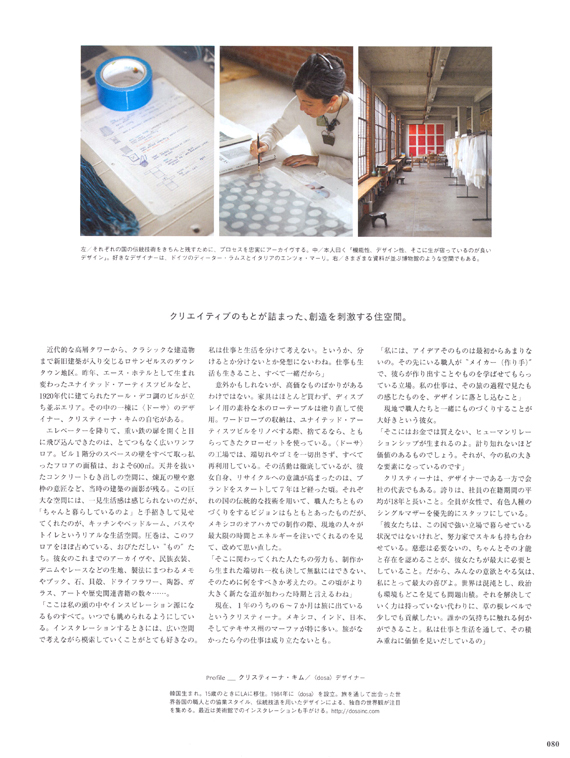 “I wake up between 4:30 to 6am, and organize my day’s schedule for about half an hour. Next 30 minutes, I’m designing, and I will read for another 30 minutes. Then, I go to work at 8:30am, although the factory starts at 7:30am. I love playing tennis during my down time.” Right: In the way that information is stored, her space is like a museum.